By Michael Lewis on June 28, 2012 - Favors for friends are not unusual, but a Notary for a national stock brokerage found out the price for such a favor can be steep when it involves breaking the rules of proper notarization. By David Thun on June 28, 2012 - Don’t let a deadline pressure you into a rushed job that could lead to problems — such as the dispute in South Dakota after a lawmaker notarized his own election documents. By Kelle Clarke on June 28, 2012 - In an ongoing effort to combat predatory immigration assistant scams, more states are enacting laws regulating those who offer assistance to immigrants. By Michael Lewis on June 28, 2012 - The U.S. Supreme Court ruling that overturned part of Arizona’s strict law cracking down on undocumented immigrants has created uncertainty for many foreign-born residents. By NNA Staff on June 28, 2012 - Can a California Notary have two stamps and two embossers? I would like to have one set that I keep at home and one set for work. 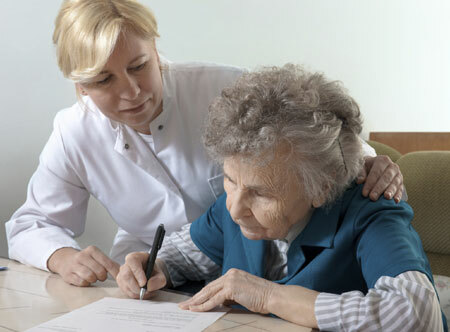 By NNA Staff on June 19, 2012 - There are steps every Notary can take to encourage the cooperation of an elderly signer and ensure that they are aware of the contents of the documents and willing to sign them. By David Thun on June 19, 2012 - Many states are now allowing Notaries to apply for commissions online in order to save time and money on processing. By Michael Lewis on June 19, 2012 - The document-signing, notarization and other loan servicing standards implemented by the National Mortgage Settlement currently apply to only five major lenders and are set to expire in 2015. As a result, states are beginning to introduce measures to expand the reach of the terms and make them permanent. By Kelle Clarke on June 19, 2012 - The Florida Department of Law Enforcement has launched an investigation into three Supreme Court justices who allegedly used court employees to notarize their 2012 campaign paperwork. By NNA Staff on June 19, 2012 - The Consumer Financial Protection Bureau (CFPB) has released an alert to banks and small business financial institutions under its supervision, reminding them that they are responsible for proper oversight of all third-party service providers they employ, to ensure they are compliant with new federal regulations.